By Tomasz Szlagor With colour profiles by Janusz ?wiatlo? Excellent production quality and attractive subject material. 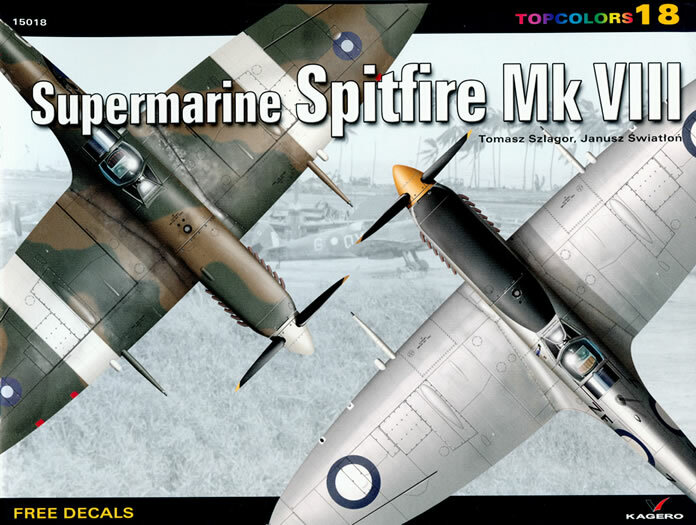 Great value if you have several Spitfire VIII subjects to build, particularly if they are in larger scales. 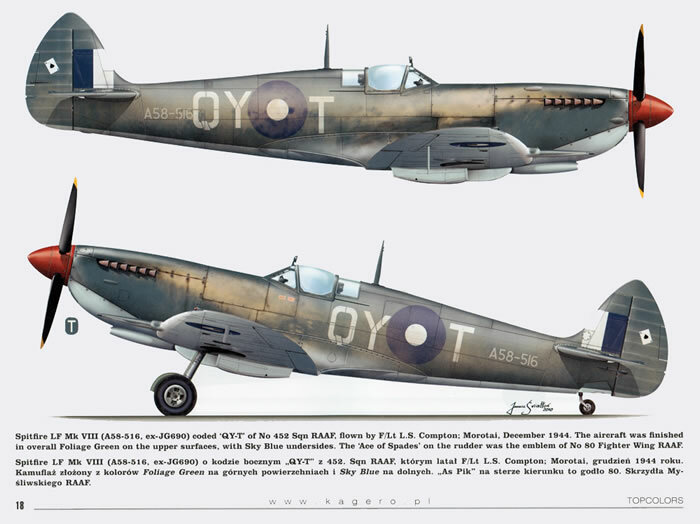 Kagero continues their coverage of the Supermarine Spitfire in their Topcolor series. This time the Mk VIII gets the treatment. This volume follows the standard format of the Topcolour series. The opening text is minimal comprising just three pages that provide you with a very brief summation of the characteristics and the operational employment of the Mk. VIII. Following this, you are straight into the profiles which cover 19 different machines. The artwork is by Janusz ?wialo? and each subject has been beautifully rendered to show shadowing, weathering and tonal contrasts. 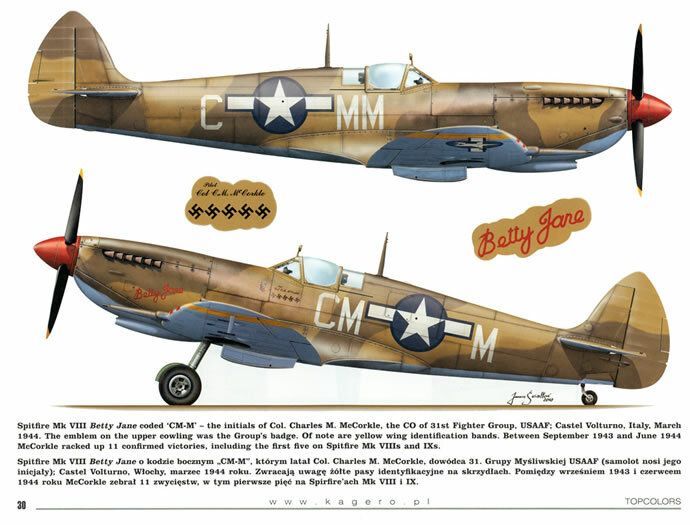 Each of the profiles are accompanied by text (in both the English and Polish languages) that identifies the squadron and pilot (when known) of each aircraft depicted. 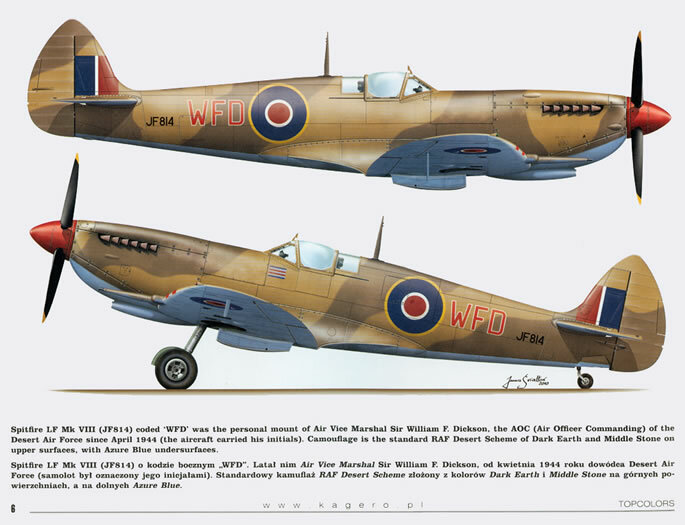 LF Mk VIII JF814, the personal mount of the AOC of the Desert Air Force, Air Vice Marshal Sir William Dickson. The machine is finished in the RAF desert scheme comprising dark earth and middle stone over azure blue undersides with a red spinner and back plate. The machine wears the Air Vice Marshal’s initials (WFD) in red with a thin white outline. The machine also sports his rank pennant under the windscreen on the left hand size of the fuselage. To me, the pennant as it is illustrated on the drawing and as provided on the accompanying decal sheet looks to be more of an Air chief marshal’s one (the red horizontal bars of an Air Vice Marshal’s pennant are much thinner). The illustration also shows the machine (and all the others in the book) to be fitted with a clear position light in a blister behind the antenna mast. As far as I know, this light was not fitted to the Mk VIII. You get both left and right hand side profiles of this machine as well as a full upper surface plan view and scrap views of the undersides of both wings. Decals are provided for this option. HF Mk VIII A58-614, ZP-Q of 457 Squadron Royal Australian Air Force (RAAF) flown by Flight Lieutenant “Alf” Glendenning from Morotai Island in early 1945. 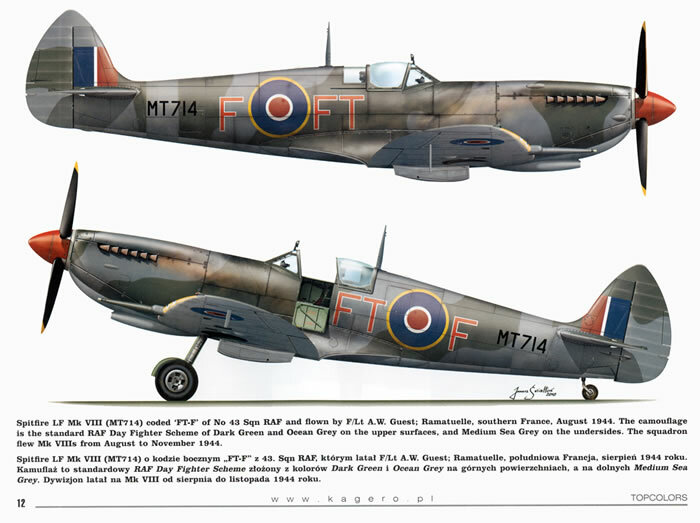 The machine is in the standard RAF day fighter colour scheme comprising dark green and ocean grey upper surfaces over medium sea grey undersides with a red spinner and white leading edges (a Pacific Theatre identification marking) to its wings. It wears the very impressive and truly fearsome late type shark mouth marking that decorated the 457th’s Mk VIIIs as well as “Grey Nurse” scripts on either side of the fuselage forward of the windscreen and the RAAF’s 80th Fighter Wing’s ace of spades marking on the rudder. 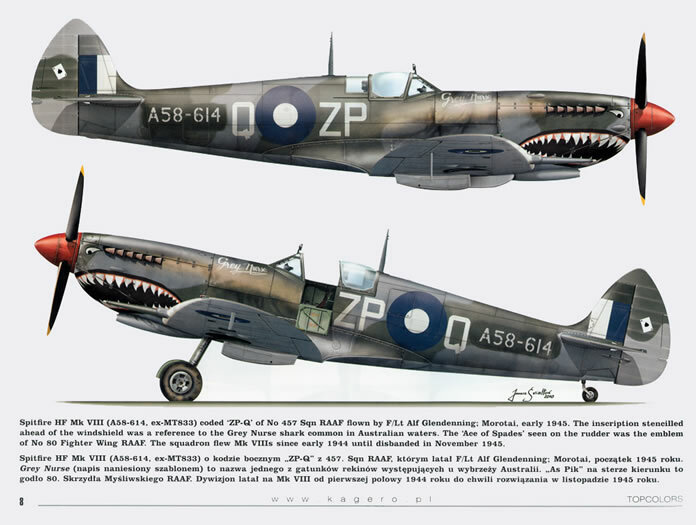 Both left and right hand side profiles of the fuselage are provided but sadly, neither this machine nor the other shark mouthed one below are depicted on the decal sheet. HF Mk VIII A58-606, ZP-W of 457 Squadron RAAF flown by the unit’s Officer Commanding, Squadron Leader B.D. (Bruce Duddridge) Watson from Morotai Island in early 1945. This machine too is in the RAF day fighter scheme with a red spinner and white leading edges to its wings. It sports an early version of the shark mouth markings that decorated the 457th’s Mk VIIIs as well as the “Grey Nurse” scripts on either side of the fuselage forward of the windscreen and the 80th Fighter Wing’s ace of spades marking on the rudder. Both left and right hand side profiles of the fuselage are provided. 43 Squadron RAF from Ramatuelle in southern France in the August of 1944. The machine wears the RAF day fighter scheme with a red spinner and its sky coloured identification band around the rear fuselage painted out in medium sea grey. Interestingly, its squadron code letters are red with a thin white outline. Left and right hand side profiles as well as a full upper surface plan view and scrap views of the undersides of both wings are provided. Decals are also provided for this option. LF Mk VIII MD324 KW-R of 615 Squadron RAF at Patel, India in the June of 1944. The machine is finished in the RAF temperate scheme of dark green and dark earth upper surfaces over sky under surfaces. It wears a white spinner, squadron codes and a nose art (a dog) as well as South East Asian Air Command (SEAC) light blue and dark blue national insignia. 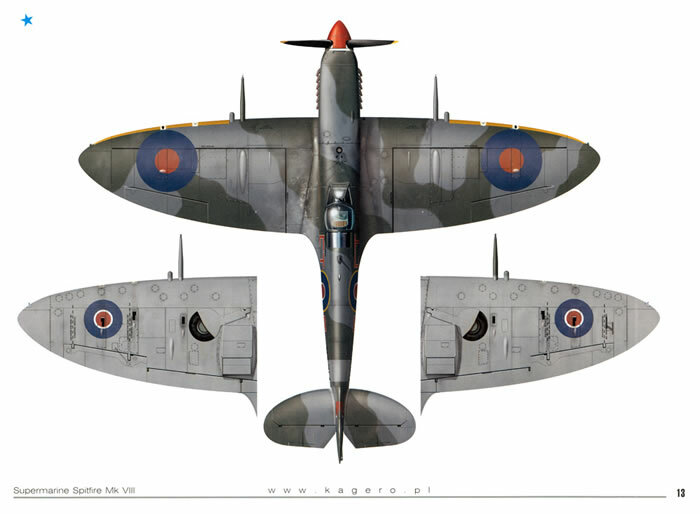 Left and right hand side profiles as well as a full upper surface plan view and scrap views of the undersides of both wings and a large scrap view of the nose art are provided. Decals are included for this option. LF Mk VIII MT687 BQ-C of 451 Squadron RAAF at Gragnano, Italy in the late October of 1944. The machine is wearing RAF temperate scheme with a sky spinner and white squadron codes. Nose art in the form of what looks to be a crudely painted Kookaburra is worn on the left hand side of the nose. Both left and right hand side profiles of the fuselage are provided as well as decals. LF Mk VIII A58-411 QY-P “Betsy” flown by Flying Officer Peter Bullock of 452 Squadron RAAF from the Sattler airstrip in Australia’s Northern Territory in late 1944. 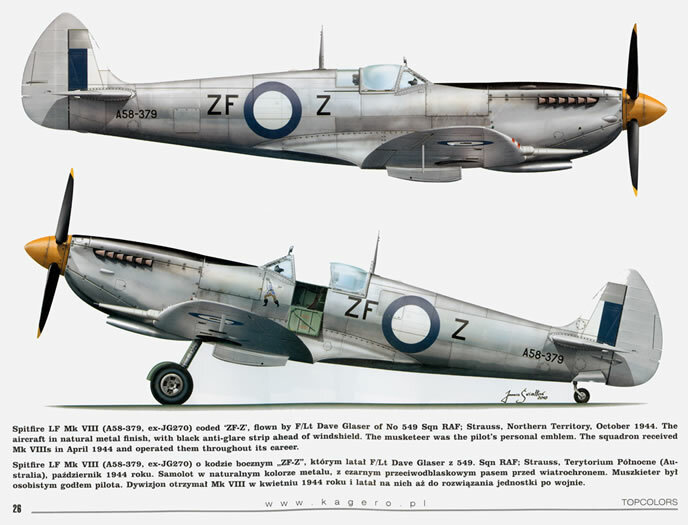 The accompanying text advises that the machine wears a highly waxed and polished camouflage scheme of “dark green, and foliage green upper surfaces over sky blue undersides”. The spinner is in foliage green and the wing leading edges are in white as are the squadron codes and the name “Betsy” which is worn under the windscreen on the port side of the fuselage. Other references describe this machine as being finished in the RAF desert scheme with the middle stone being replaced by foliage green with yet others describing it as being in overall foliage green. 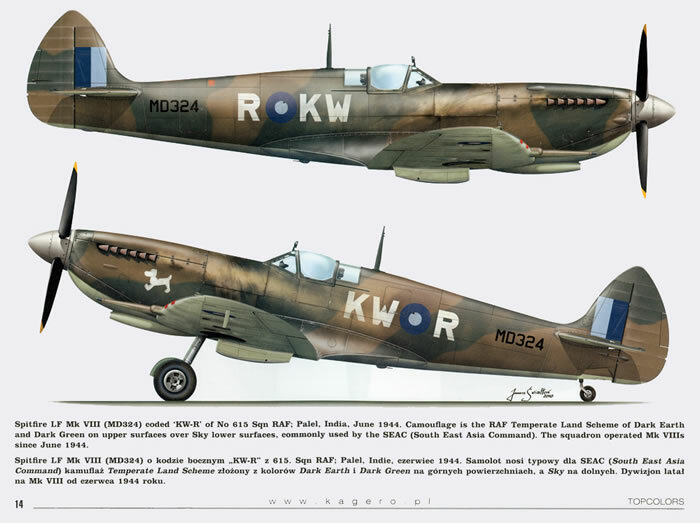 Other references also describe the squadron codes and the name as being in RAAF sky blue. Your choice! Both left and right hand side profiles of the fuselage are provided as well as decals. LF Mk VIII A58-516 QY-T flown by Flight Lieutenant L.S. Crompton of 452 Squadron RAAF from Morotai in the December of 1944. 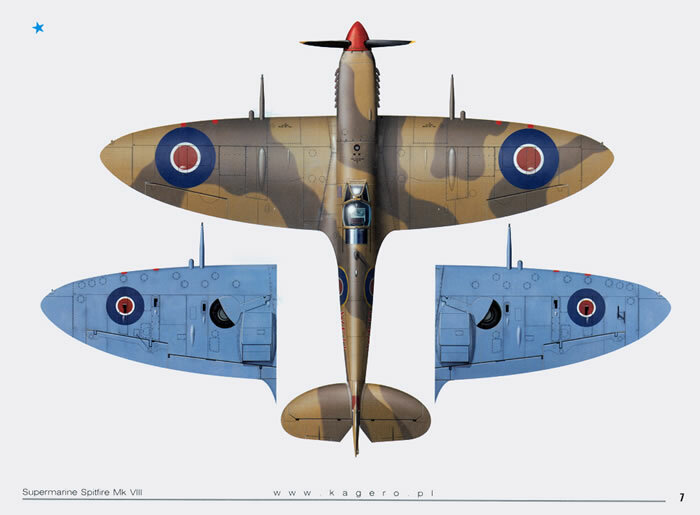 The machine wears foliage green upper surfaces over sky blue undersides and a red spinner and white leading edges to its wings (which are illustrated differently from the photographs of the aircraft). 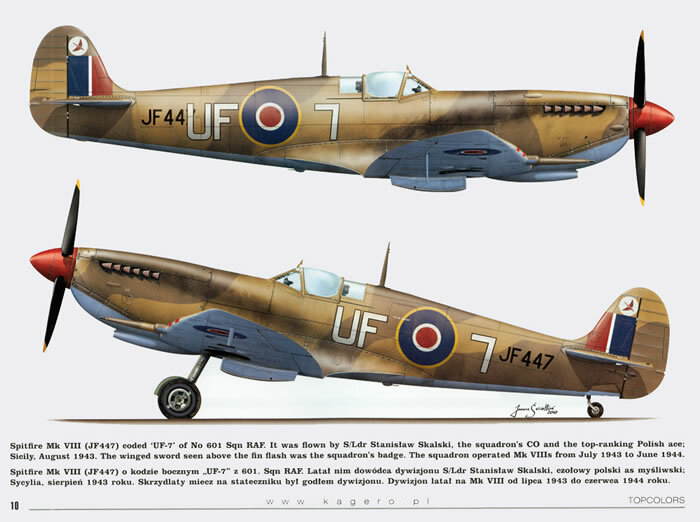 It also wears white stencil style squadron codes (which are correctly depicted with the stencil breaks in the right positions) and grey serials as well as the 80th fighter wing ace of spades insignia on both sides of its rudder and two Japanese rising sun flag ‘kill’ markings under the windscreen on the left hand side of the fuselage. Left and right hand side profiles as well as a full upper surface plan view and scrap views of the undersides of both wings are provided. Decals are provided for this option. LF Mk VIII A58-517 “HAVA· GO ·JO ! !” FLOWN BY Flight Lieutenant Norm Smithells of 79 Squadron RAAF from Morotai in early 1945. 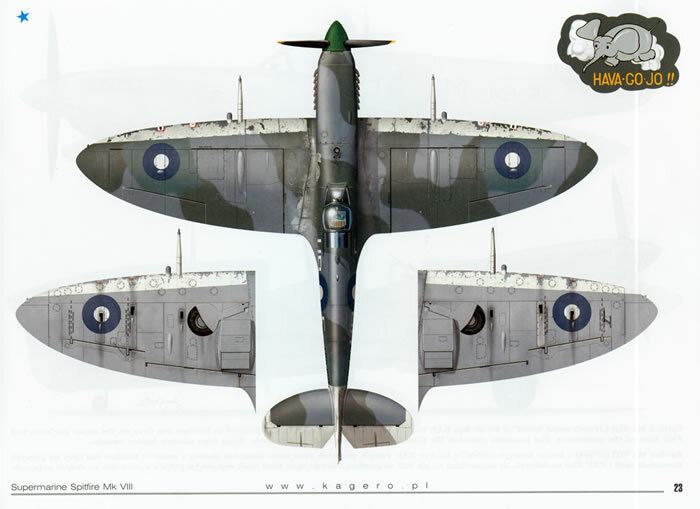 The profile shows the machine in the standard but very weathered RAF day fighter scheme with a green spinner, very weathered wide white leading edges to the wings and the entire empennage (less the horizontal stabilzers), again very weathered! 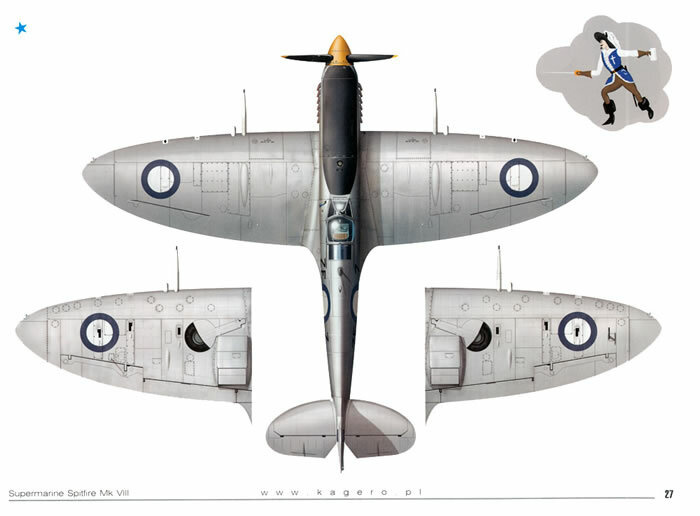 Squadron codes are shown as white and the flying elephant nose art under the windscreen on the port side of the fuselage in grey with white clouds and the writing in yellow. If ever there was a RAAF machine whose camouflage colours are hotly debated then this is the one! Other references show it in a two tone green finish with sky blue undersides and a pink elephant with sky blue codes outlined in black whilst still others show it in RAF desert finish with the middle stone replaced by foliage green with white codes. With yet other references describing it as wearing a light blue spinner. Whatever the scheme, photographs show that the machine was very weathered and retouched. Again, your choice! Left and right hand side profiles as well as a full upper surface plan view and scrap views of the undersides of both wings are provided. Decals are provided for this option. HF Mk VIII JF404 GZ-M of 32 Squadron RAF at Foggia, Italy in early 1944. The machine wears extended wing tips with its upper surfaces painted in medium sea grey and its undersides in PRU blue. It wears black squadron codes and serial as well as type B roundels on the upper surfaces of its wings and the sides of its fuselage. 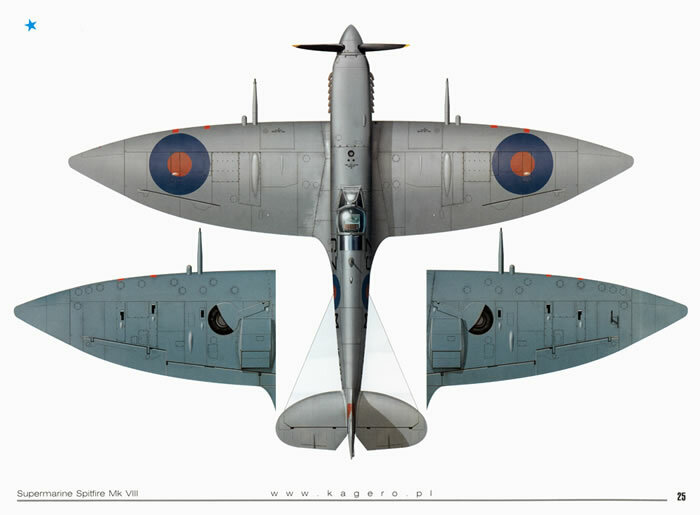 Left and right hand side profiles as well as a full upper surface plan view and scrap views of the undersides of both wings and decals are provided. LF Mk VIII A58-379 ZF-Z of 549 Squadron RAF. The machine was flown by Flight Lieutenant E.D. (Ernest Derek) “Dave” Glaser RAF from Strauss airstrip in Australia’s Northern Territory in the October of 1944. The machine is in overall natural metal finish with a yellow spinner and a black anti-glare panel on the nose, squadron codes and serials. It also wears RAAF pacific theatre blue and white roundels/fin flashes and sword wielding Musketeer nose art under the windscreen on the port side of the fuselage. Other references have described this machine as wearing a blue spinner and cannon barrels as well as a yellow spinner and cannon barrels. Left and right hand side profiles as well as a full upper surface plan view and scrap views of the undersides of both wings are provided. Decals are provided for this option. LF Mk VIII A58-457 “SWEET AS A SONG” belonging to 457 Squadron RAAF and flown by Squadron Leader Tom Trimble from the Sattler strip in the Northern Territory in late 1944. The machine wears foliage green and dark earth upper surfaces over sky blue undersides. The wings wear the white leading edge theatre markings and the name “SWEET AS A SONG” is also in white. 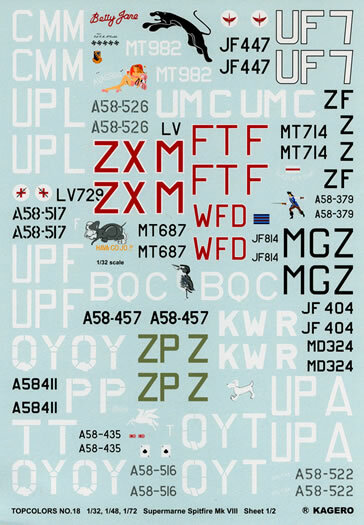 The text advises that the squadron code letters were “most probably” sky blue yet they appear in a dirty RAF sky shade on the decal sheets. A Squadron Leader’s pennant is also worn under the windscreen on the port side of the nose but it is shown as a white square divided by a thin red line on the illustration as well as the decal sheets where as it should be in a light blue shade – to be fair though the known photographs of this aircraft do show it to be a non standard pennant in that it is missing its blue boarders to the top and bottom of the pennant. Also, the illustrations show it to be wearing a black spinner where other references state it to be red with the backing plate in white. Left and right hand side profiles as well as a full upper surface plan view and scrap views of the undersides of both wings are provided. Decals are provided for this option. 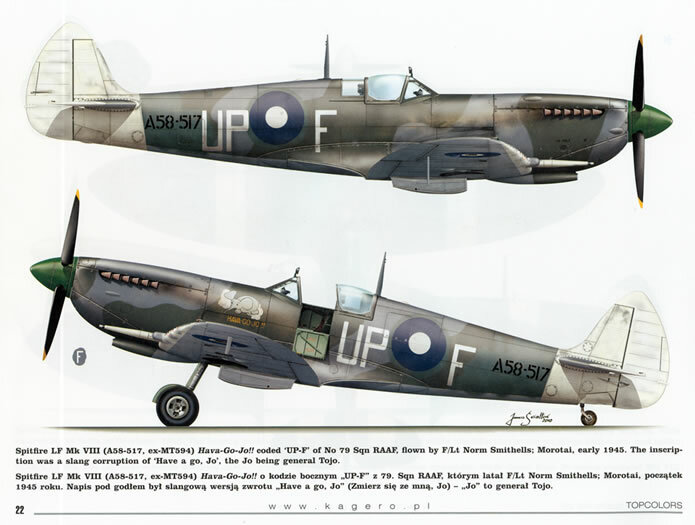 LF Mk VIII LV729 ZX-M of 145 Squadron RAF flown by Squadron Leader George R.S. McKay from Bellaria, Italy in late 1944. It wears the RAF day fighter scheme with a red spinner and red squadron codes outlined in white. It also wears small squadron insignia on either side of the nose. Both left and right hand side profiles of the fuselage as well as decals are provided. LF Mk VIII A58-453 QY-T of 452 Squadron RAAF flown by Flight Lieutenant William “Ron” Cundy from the Sattler strip in the Northern Territory in mid 1944. 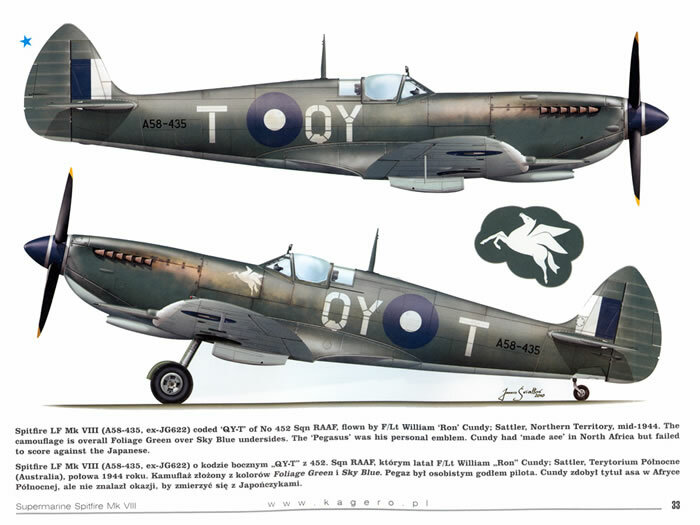 The illustration shows the machine as being finished in foliage green upper surfaces over sky blue undersides with white squadron codes and wing leading edges as well as a flying horse on the port side of the fuselage under the windscreen. The spinner is black with a thin white band and the backing plate is also in white. Other references show this machine as wearing sky blue codes and a sky blue winged horse. 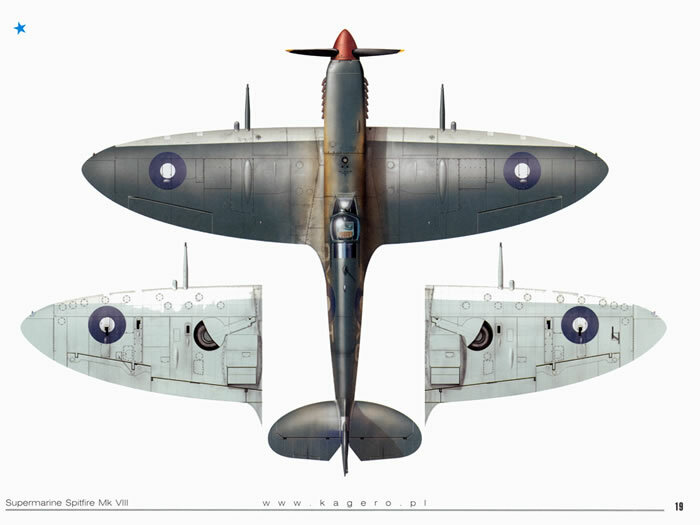 Both left and right hand side profiles of the fuselage as and a scrap view of the winged horse as well as decals are provided. LF Mk VIII A58-522 “HAL-FAR” UP-A of 79 Squadron RAAF flown by Flight Lieutenant “Len” Reid from Morotai in 1945. The machine is in standard RAF day fighter scheme minus the sky fuselage band. Squadron codes are in white as is the name “HAL-FAR” whilst the serial is in grey. The spinner is shown as being sky whilst other references state that it was white. The illustration shows the machine fitted with the standard RAF bomb rack whilst the machine was actually fitted with a locally fabricated bomb rack that differs greatly. Both left and right hand side profiles of the fuselage as well as decals are provided. LF Mk VIII A58-526 UP-L “AVAGROG” of 79 Squadron RAAF based on Morotai in mid 1945. It wears the standard RAF day fighter scheme less the sky fuselage band. The code is in grey whilst the spinner, code letters, the words “AVAGROG” and the leading edges to the wings are in white. It also wears nose art on the left hand side of the nose in the form of a bikini clad lass offering a beer. 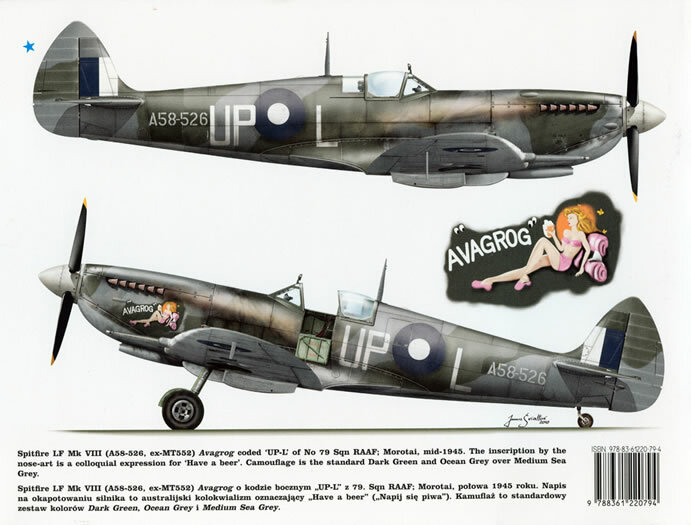 Both left and right hand side profiles of the fuselage as well a scrap view of the nose art and decals are provided. 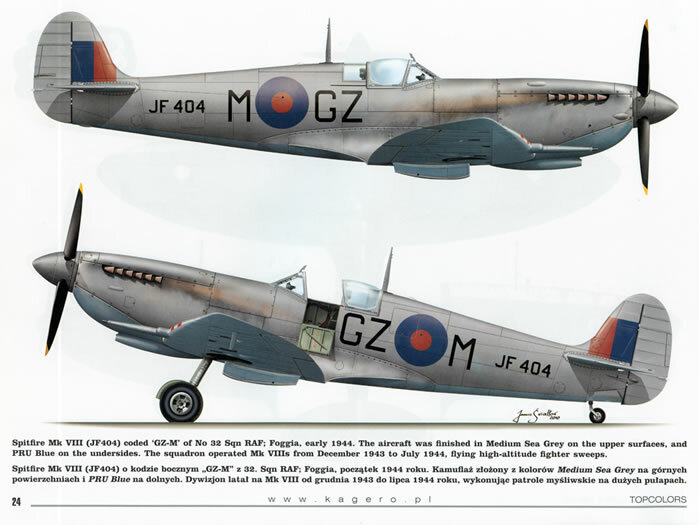 As with all books in the Topcolour series, you are also provided with decals to model some of the aircraft within the book. 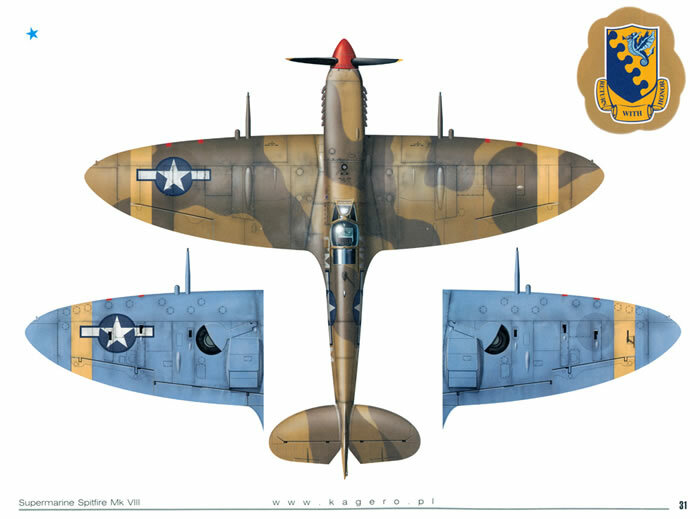 You get two very large sheets with the markings in 1/72, 1/48 and 1/32 scale. 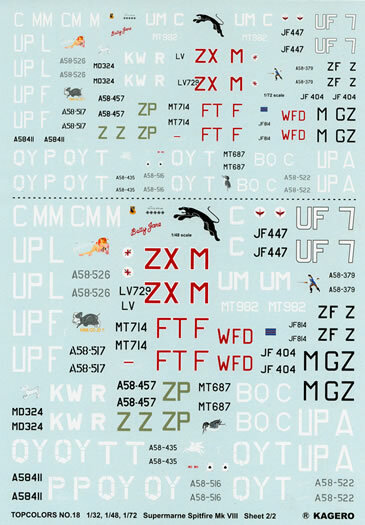 The decals are confined to the individual identifying markings worn by each option so you are on your own for the national insignia and stencil data. There is no advice as to who the decals have been produced by. However, they are thin, in perfect register and have an absolute minimum of film surrounding each subject. 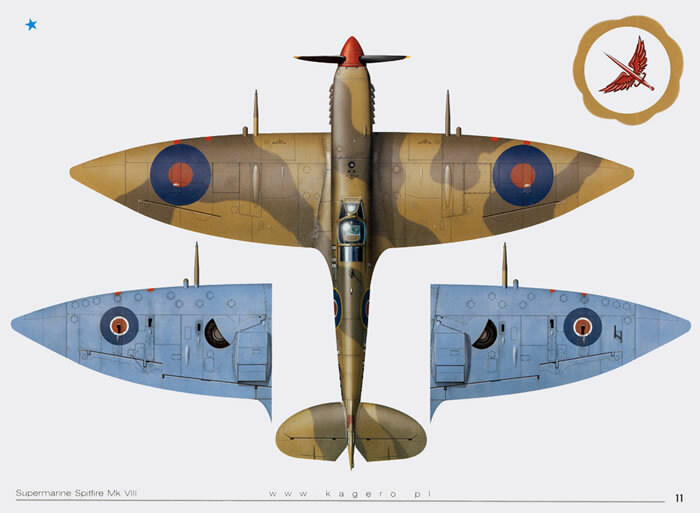 If you have a hankering to build the new 1/32 scale Tamiya Mk VIII Spitfire and want to finish it in different markings then this book/decal sheet from Kagero will help you out. Sure, it may have some inaccuracies but further research will iron out the bugs. I was especially pleased to see that RAAF Mk VIIIs figured prominently and that some of the aircraft depicted have not been presented in decal format before. Thanks to Casemate Publishing for this review sample.